Equipped with Sigma’s own unique technology OS (Optical Stabilizer) function. Two SLD (Special Low Dispersion) glass elements and two aspherical lenses provide excellent correction for all types of optical aberrations. This high zoom ratio lens is exclusively designed for digital SLR cameras and is capable of covering a wide range of focal lengths from wide angle to telephoto. It is equipped with Sigma's own unique technology OS (Optical Stabilizer) function. This function uses two sensors inside the lens to detect vertical and horizontal movement of the camera and works by moving an optical image stabilizing lens group, to effectively compensate for camera shake. It automatically detects movement of the camera and compensates for camera shake when shooting moving subject such as motor sports. Two SLD(Special Low Dispersion)glass elements and two aspherical lenses provide excellent correction for all types of aberrations. The super multi-layer lens coating reduces flare and ghosting. This lens provides superior image quality throughout the entire zoom range. An inner focusing system eliminates front lens rotation, making the lens particularly suitable for using circular polarizing filters and the petal-type lens hood supplied. 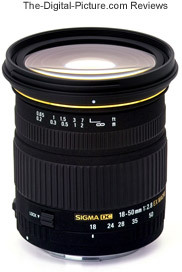 The Sigma Corporation is pleased to announce the launch of the new 18-50mm F2.8 EX DC MACRO lens. This lens has a large aperture of F2.8 throughout the entire zoom range, a minimum focusing distance of 20cm (7.9”) and a maximum magnification of 1:3, making it ideal for close-up photography. Specially designed to suit the characteristics of digital SLR cameras this lens provides a high level of optical performance. Its design incorporates both glass-mold and hybrid aspherical lens technology which offers superior peripheral brightness, extremely high image quality as well as a compact and lightweight construction. Special Low Dispersion (SLD) and Extraordinary Low Dispersion (ELD) glass elements provide excellent correction of color aberrations. The super multi-layer lens coating reduces flare and ghosting, a common problem with digital cameras. High image quality is assured throughout the entire zoom range. An inner focusing system eliminates front lens rotation, making the lens particularly suitable for using the petal-type lens hood (supplied) plus circular polarizing filters. · Minimum focusing distance of 20cm with a maximum magnification of 1:3. · Aspherical lenses offer compact and lightweight construction. · SLD and ELD glasses offer excellent correction of color aberrations. Canon today launches the portable devices, designed with EOS and other digital photographers in mind. The Canon Media Storage M30 and Canon Media Storage M80 devices feature a large ultra-bright 3.7” TFT screen with 160º viewing angle for image and video review, and a 30Gb/80Gb hard disk to store digital images, movie and sound files of various file formats. Both the Canon Media Storage M30 and Canon Media Storage M80 feature a USB 2.0 Hi-Speed interface and slots for CF and SD cards. With their tough, robust magnesium alloy bodies and intuitive navigation familiar to EOS owners, the devices add an important link to the workflow chain of professional photojournalists and photographers on location, outdoor and expedition shoots. The Canon Media Storage M30 and Canon Media Storage M80 are also expected to be popular with the increasing body of every-day photographers looking for new ways to store and display favourite shots and extend storage capacity whilst away from the computer. Support for multiple image, video and sound file formats, including Canon RAW, MPEG, MP3 and WAV. In addition to the capacity to store Canon RAW and JPEG images, the Media Storage M30 and M80 units can also store and display / playback a variety of multi-media files. A headphone jack is provided for audio playback of MPEG as well as WAV and MP3 files. Designed for professional use, the units are robust, reliable and secure. The 1.8” HDD is chosen for its stability and superior protection features and both units are protected with a tough, rugged magnesium alloy outer casing. To avoid corruption, files are validated during upload from memory card. To prevent unauthorised access, images and other files can be protected with an up to 8 digit password. For EOS photographer convenience, the units take the BP 511A battery used in various EOS models including the EOS 5D, EOS 20D and EOS 30D, as well as professional products such as the WFT E1 Wireless File Transmitter. These portable multimedia storage/viewer devices will compete with Epson's new P-3000 and P-5000 multimedia storage/viewers. Just announced is the Tamron 18-250mm f/3.5-6.3 XR Di II Lens. September 2006, Saitama, Japan - Mr. Morio Ono, President of Tamron Co., Ltd., announces at Photokina 2006 in Cologne, Germany, that the company has developed the AF18-250mm F/3.5-6.3 Di-II LD Aspherical (IF) Macro (Model A18), a lightweight, compact and ultra high power zoom lens designed exclusively for digital SLR cameras with APS-C sized imager sensors. The AF18-250mm F/3.5-6.3 Di-II LD Aspherical (IF) Macro is the ultimate high power zoom lens boasting the world's greatest zoom ratio(*1) of 13.9X, a milestone that Tamron, the pioneer of high power zoom lenses, has achieved by commanding its technologies to further expand the capabilities of high power zoom lenses. (*1) As of September 2006. Based upon Tamron's research of lenses for exclusive use with digital SLRs equipped with APS-C sized image sensors. (*2) Here in after, the expression "equivalent to APSC" is omitted. To prevent the lens from becoming bulky, the design concept of the AF18-200mm F/3.5-6.3 XI Di-II LD Aspherical (IF) Macro (Model A14), a popular lens among the world's digital SLR users since it is the ideal high power zoom lens, was the basis for this new lens that features an expanded focal length to 250mm at its tele-end. With the new AF18-250mm zoom lens that provides enhanced image quality, Tamron has achieved an astounding 13.9X zoom power, the world's greatest in the class of zoom lenses; yet the increase in size is confined to a mere 0.2mm more in its maximum diameter and just 0.6mm in overall length, in a lens that offers a 388mm ultra telephoto focal length (diagonal angle of view of 6° 23') when converted to the 35mm film format. 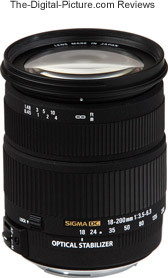 (Ref 1) The greatest zoom power previously delivered by a high power zoom lens is 11.1X and is found on the AF18-200mm Di-II (Model A14) made by Tamron. The new zoom lens covers up to a 250mm telephoto focal length, the longest focal length among zoom lenses that start with an 18mm wideangle focal length available on the market for exclusive use with digital SLR cameras. Thus, it provides an overwhelmingly impressive telephoto effect that is entirely different from the effect obtainable at 200mm on conventional high power zoom lenses. The new zoom lens will satisfy the expectations of photographers that are used to the 300mm tele-end of Tamron's AF28-300mm Di (Model A061) when used on a digital SLR camera. (Ref 2) Di (Digitally integrated)-II lenses are designed for exclusive use with digital SLR cameras having APS-C size imagers. Di-II lenses are not designed for use with 35mm film cameras nor digital SLR cameras with image sensors larger than 24 x 16mm. (Ref 3) The ratio Tamron uses to convert 35mm focal length equivalents is 1.55X. Tamron's concept for the development of high power zoom lenses is "one-does-it-all, covering wideangle to telephoto" to satisfy customer needs for simplicity. Tamron has always kept this concept in mind when designing higher power zoom ranges. The question, "to what extent can the tele-end of a zoom starting with 18mm wideangle be extended in a lens designed for exclusive use with digital SLRs?" was posed and answered with the development of this ultra high power zoom lens possessing the world's largest zoom ratio of 13.9X. It is not too long ago that the world of "wideangle to ultra telephoto film photography" could only be achieved with a combination of two zoom lenses; 28-200mm + 200-400mm (*3). Now, the world of digital SLR photography can be enjoyed with just a single zoom lens! (*3) Around year 2000. A combination of 28-200mm (Model 371D) and 200-400mm. The optical system uses an LD (Low Dispersion) glass element and one AD (Anomalous Dispersion) lens in the first group to minimize on-axis chromatic aberration while achieving the 250mm ultra-tele focal length. In addition, suitable positioning of two hybrid aspherical lens elements serves to meet the desired compactness despite its 13.9X zoom power. In particular, Tamron's engineers have pursued a thorough analysis of the optical configuration of the third lens group for optimum power distribution in the overall optical system. The approach has resulted in the sufficient compensation of aberrations, including astigmatism; the compactness, thanks to downsizing of the first group; the high zoom power; and optimum optical quality. (Ref 4) In order to realize the remarkable 13.9X zoom ratio, Tamron has pursued the approach to accomplish the compactness through optimization of the overall optical system, not through the employment of XR glass elements. The new zoom lens achieves a minimum focus distance of 0.45m (17.7") throughout the entire zoom range, top of the class capability among high power zoom lenses for digital SLR cameras, which results in a maximum magnification ratio of 1:3.5 at the 250mm tele-end. (*4) (*4) Since the APS-C sized imager is smaller than the 35mm format film, the new zoom lens can fill the frame with almost the same scope (approx. 8 x 5.5cm) as a lens with a maximum magnification ratio of 1:2.3 on a 35mm film SLR camera. Complicated mechanisms are built into the compact body, thanks to new mechanical devices, for excellent portability and ease of use. 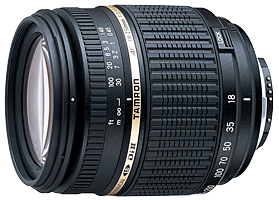 Based on the mechanical construction of the AF28-300mm (Model A061), Tamron has revolutionized accumulated mechanical design technologies by reviewing the roles respective barrel parts play in order to achieve the high power, compactness and light weight. Additionally, the production engineering has been completely overhauled to downsize its parts and to increase their precision and durability in order to accommodate the complex structure in the new zoom lens. (Ref 5) In order to realize the 13.9X high zoom power, the lens uses a metal mount in all fittings. • New External Design of the New Di-II Series Conveys the Image of "High Performance, High Precision"
Improvements have been made to the external design by adding a gold-colored band between the focus and zoom rings to enhance the appearance and make the product stand out as a Di-II lens. Also, the black coating over the entire lens barrel creates a high-quality, sophisticated look. The rubber patterns of the focus and zoom rings have also been improved to complement the digital camera style and to provide better handling. Canon has posted the DPP v2.2 Updater. Select the Drivers/Software link from the linked-to page. Now we know that Canon's DIGIC III is real. Canon today announced several new point & shoot camera models that include the 10 megapixel Canon G7 with DIGIC III. Sorry - No digital SLR-related announcements were made. Canon has posted the EOS Digital Photo Guidebook for Professionals. I have not previewed this 7.6 MB PDF file, but it looks (based on the index) like we can all learn something from the contents. I'm a couple of days late (just back from a short trip), but the Canon 400D/Rebel XTi is now shipping. Check your favorite retailer (including B&H) for current stock status. A new Tamron Rebate program is in effect through the end of this year. Twelve lenses are listed. 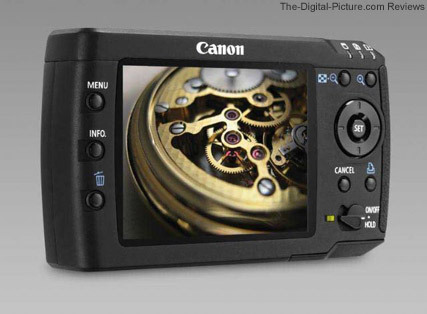 Canon USA's site now has the 400D/Rebel XTi User Manual available for downloading. Select the "Product/Software Manuals" link. This is a 5.14 MB PDF file. If you have not checked Canon's Picture Styles Site recently, you might want to browse the currently available for download picture styles. New for September is the Autumn Hues style. Please be aware that there has been a fraudulent online promotional offer suggesting that Canon digital camera products can be purchased for unreasonably low prices directly from Canon. This may include the Canon logo, company name and/or product images. This is in no way associated with Canon Inc. or any Canon Group companies. Buy your gear from a reputeable retailer (I added this line). Canon's Canon's Why We Love Football site is live - It's that time of the year already. The site includes information on Canon's "Show Us Why YOU Love Football" photo contest and features Pro Shooting Tips With Dennis Read Miller, veteran Sports Illustrated photographer.